Do you need an office policy manual, but don't know where to start? Many brokers who consider the hourly value of their time can't justify taking the time to write a policies manual from scratch. It's so much easier to modify an existing manual! The cost of this manual is what you should be paid for about an hour of your time, and there is simply no way you could make up a manual this complete in an hour! help to recruit the best sales associates. Prospective sales associates can see that your firm is well-organized. help you and your sales staff solve problems by providing fairness and predictability. help you achieve your company's objectives by communicating clearly to your staff how you want things done. 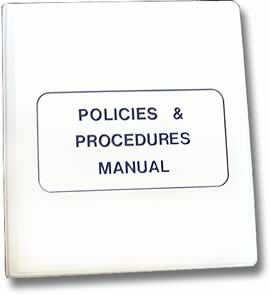 The Policies and Procedures Manual has been designed to be a guide for the preparation of your office Policies and Procedures Manual. It's in MS Word! You can modify it to meet your company's operating style! 8 1/2" by 11" Loose-leaf Binder for easy customization, so you can add and remove sheets easily. Much of the manual can be used as is with no modification. It is a living document, and we have made it easy for you to make any changes as your company grows. We include a disk to be used with most of the popular word processing software which makes modification simple. The manual is thorough and concise, with procedures for over 80 different subject areas. Many items, such as commission schedules, smoking policies, etc. are likely to be different from office to office. We have included several formats from which to choose so that implementing the manual will be easier. Want to know more? Review the Table of Contents. There are also a few sample pages. Disk included for easy editing! "With just a few minor changes to customize it to my operations, this is now our company manual. What a time-saver for me!"